August 4th at Faulkner Gallery. Note historic laundry to landscape system in foreground! 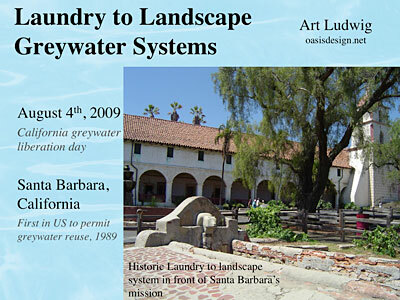 Information and background reading for Laundry to Landscape Lecture and Workshop. 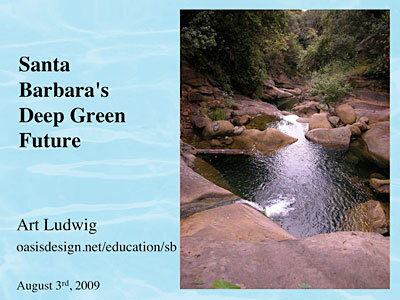 World-renowned integrated systems designer, educator and researcher Art Ludwig will explain the big picture advantages of integrated design, give specifics of what systems that enable Santa Barbarans to live better on 80% less resources would look like, and discuss options for removing institutional barriers to sustainability. Cost: $10 suggested donation, no one turned away. 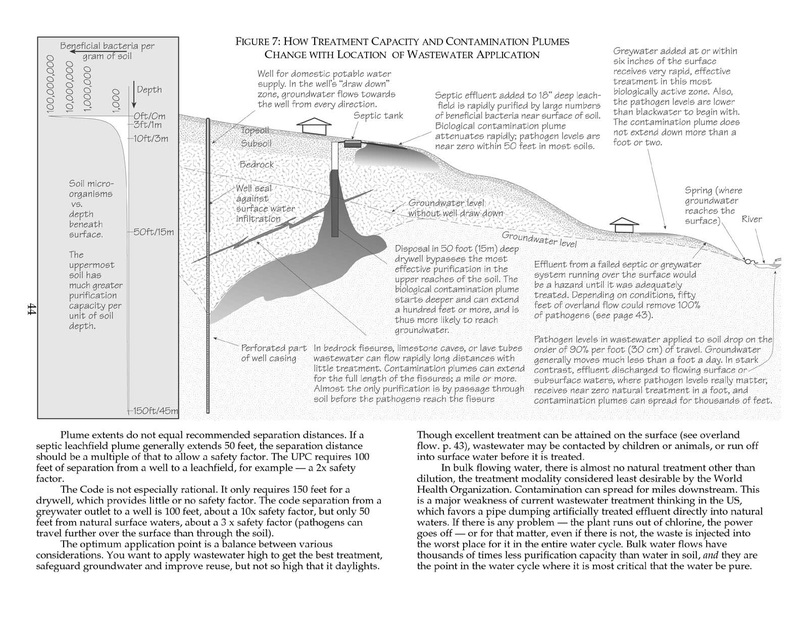 In the workshop, Art will also discuss his recent work in Sacramento, recent changes in Santa Barbara greywater policy and California state code that will open up the installation of simple, practical greywater installation to professionals as never before. 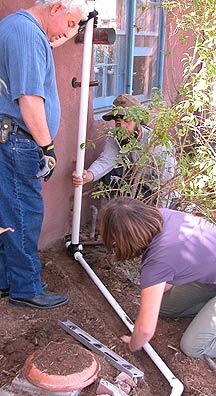 Then he'll zoom in and spend most of the time on the practical details how to install Laundry to Landscape , the simplest, least expensive, lowest effort way to irrigate with residential greywater, and the most economically and ecologically viable to install professionally. Art is seeking a small number of people with a landscaping background, who are interested in becoming local experts in professional installation of Laundry to Mulch Basin systems, to install a series of systems in advance of the workshop. These folks could also, if they wish, assist with the workshop and appear in a video he is producing on the design, installation and use of these systems. To apply for this opportunity, Email us or call at 967 9956. The more of the background info below you understand (or have been exposed to) before coming, the more you will get out of the workshop. There will be a lunch break on the day of the workshop-- we suggest you bring food to sustain yourself and/or to share. The workshop will consist of a mix of interactive discussion of what's in front of us and hands-on demonstrations/work on the land; please wear/bring appropriate clothing for both activity types. Most instruction will be in English, but Art has years of exposure to job site Spanish in the US and Mexico and can provide clarifications as needed in Spanish. Ecological Systems Designer Art Ludwig has worked on water and wastewater systems, edible landscaping natural architecture, and improved building codes since 1980. His specialty is complex, integrated "systems of systems." Art has studied and worked in 22 different countries, consulted for the states of New York and New Mexico and California on water reuse policy, and given dozens of lectures and workshops. His book Water Storage was the #1 plumbing book on Amazon for 2008, his book Create an Oasis with Greywater, the #1 landscape book.